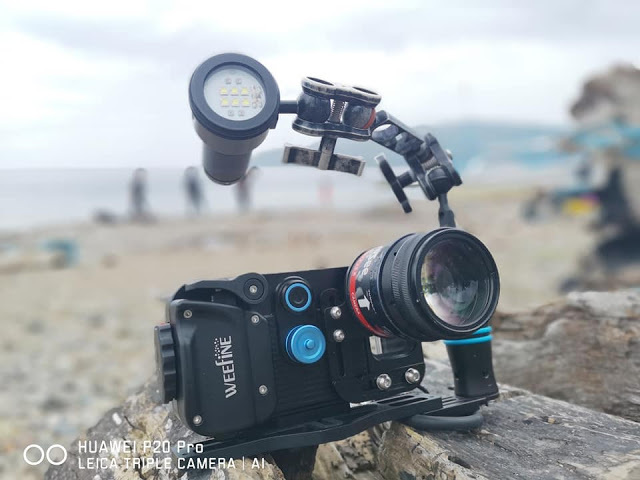 ​ Peri Paleracio (Club Ocellaris, Anilao) has kindly sent me a review of the Huawei underwater/cell phone housing with an added underwater lens, it may be of interest (1,2). It looks like it uses water proof lenses, if so, no ports are needed. Apps provide the cell phone with a dive computer and with controls for the touch screen via buttons on one side of the housing​; a vacuum leak detector is built into it. ​Let us await what the reviewers and early users have to say. This seems to be a sampler of the miniaturization with quality that is becoming available, such as the Yongnuo​​ camera (​3​) which uses the Canon EF lenses, but which still needs an UW housing with port. dSLR ​​> 4/3's mirrorless ​> Mirrorless Full Frame >​ Point & Shoot, ie Olympus TG ​1-​5 > Cell Phone > UW Huawei (and ​we hope ​UW Yongnuo and others) > Smaller, lighter, tougher, easier to use cameras and housings, with the quality of a dSLR = Survival of the fittest. Edited by Kraken de Mabini, 10 November 2018 - 04:17 PM. Here is a Huawei/Leica cell phone in a Weefine housing, with attached wet lens, mounted on a tray with lamp (1). To connect this housing to a housed dSLR or similar camera, each housing will need a HDMI or similar bulkhead (2). Once connected, the cell phone should provide a reasonably sized and priced monitor for a quality camera. Edited by Kraken de Mabini, 16 November 2018 - 11:30 AM. Intriguing, especially as an external monitor. Wonder how the brightness compares to the Small HDs and the Atomos. I'm assuming there's little comparison between a cell phone and one of those units, but I've been surprised before! As a long time fan of compacts like the Sony RX100 series the move to cell phones "makes sense". The issue for me is always low light capability. When we went to Tonga and shooting natural light you could really see the difference between my RX and another shooters full frame rig.